View of Grove Park near Watford in Hertfordshire. A large property was built on this site in the Elizabethan period and in 1753 the house had passed to the Honourable Thomas Villiers, the Earl of Jersey and British Ambassador to France who became the first Earl of Clarendon. 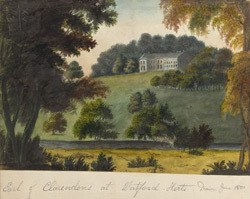 He extended the Grove became one of the most fashionable country homes in England, with distinguished visitors such as Queen Victoria and Horace Walpole. It is thought that Villiers hired Sir Humphrey Repton to undertake the landscaping. The name 'Grove' is thought to have been derived from the Old English term 'graf' meaning a thicket or wooded area, suggesting that the landscape changed dramatically here.